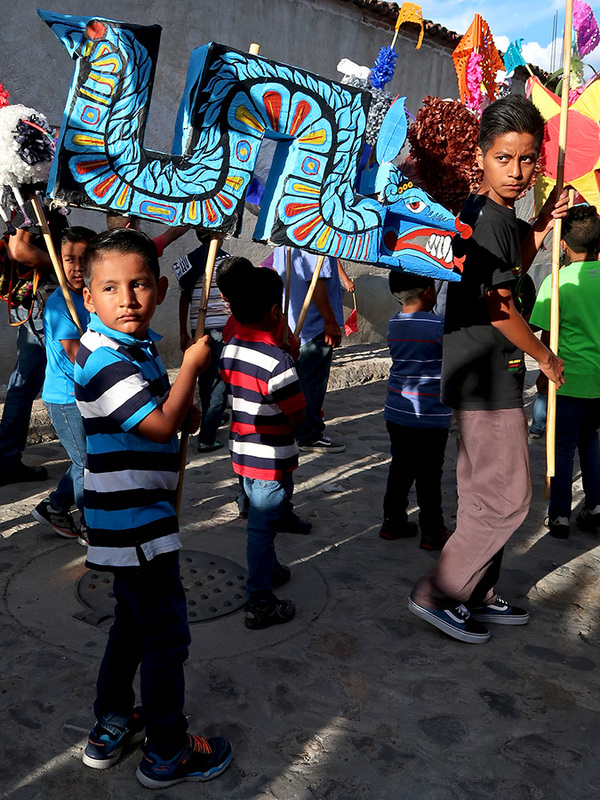 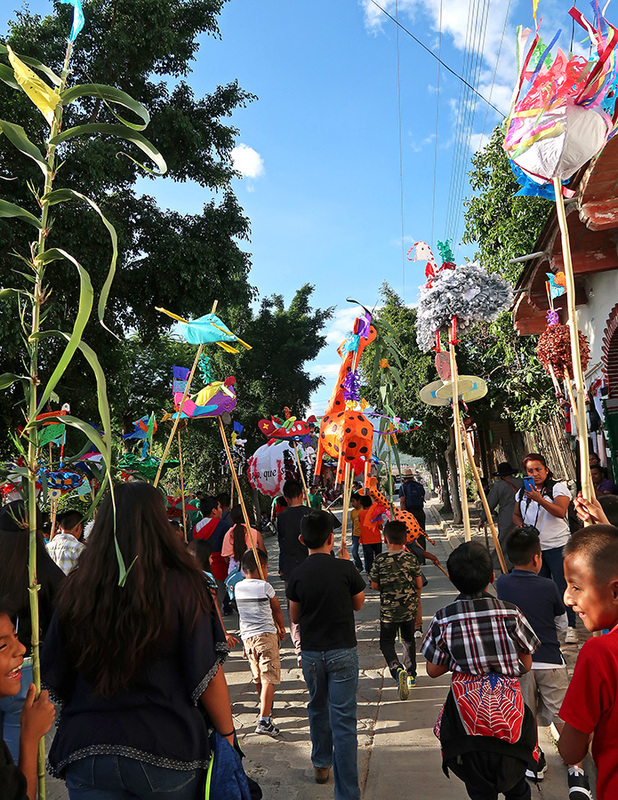 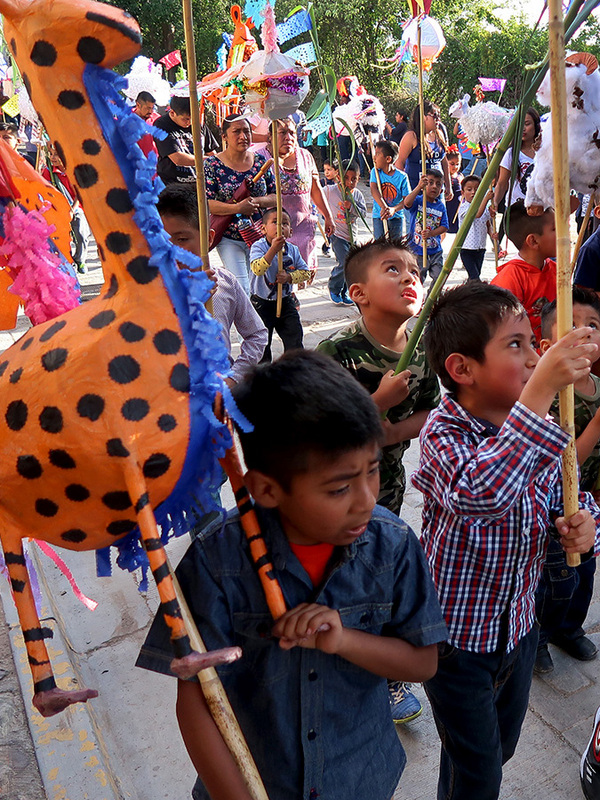 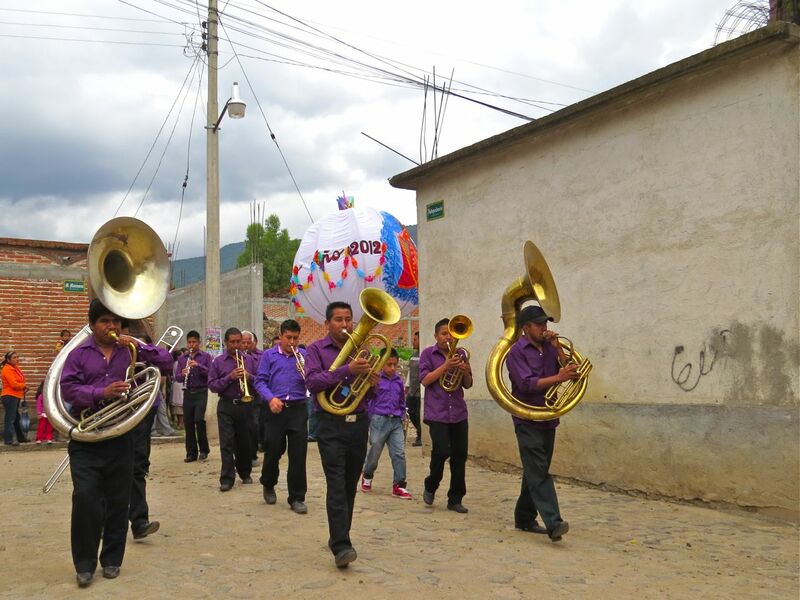 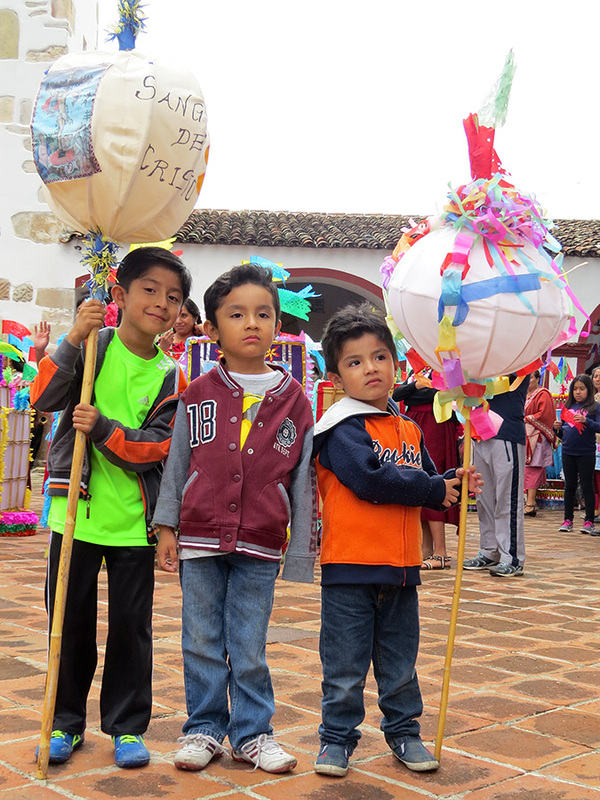 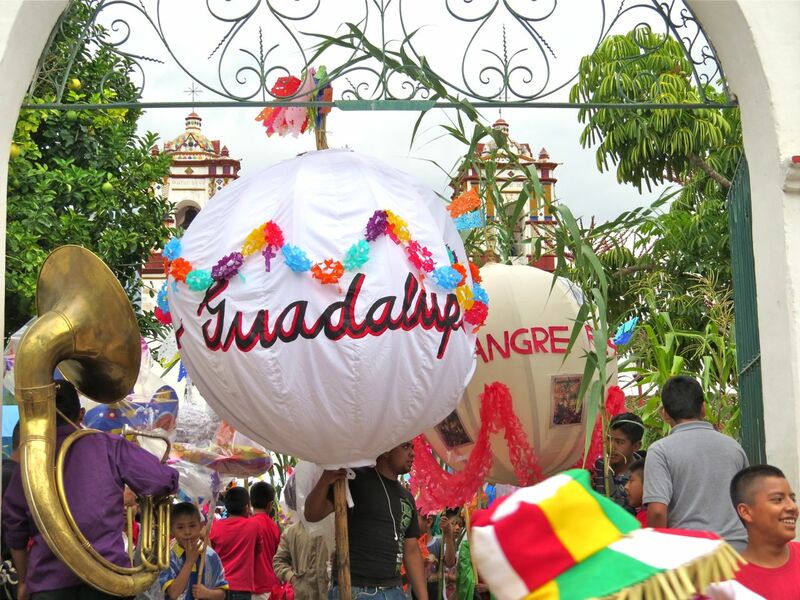 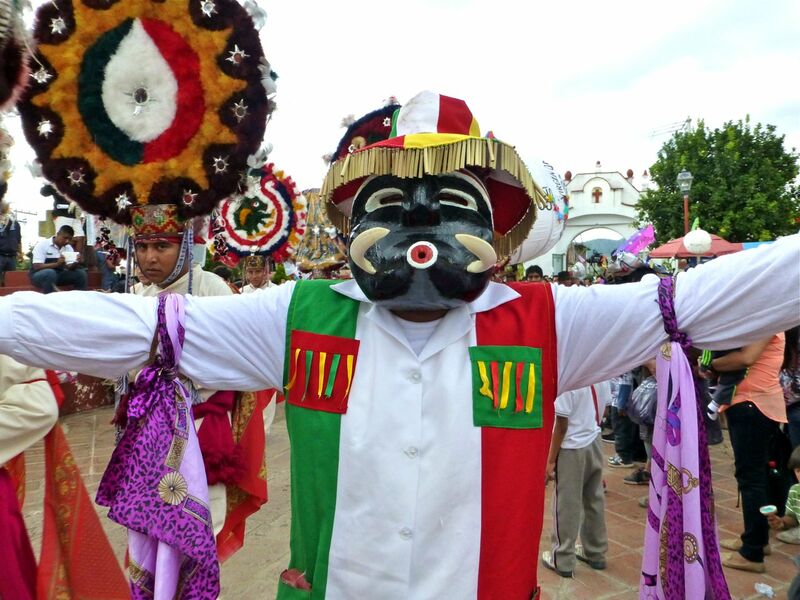 I must confess, I’m partial to Teotitlán del Valle and this fiesta. 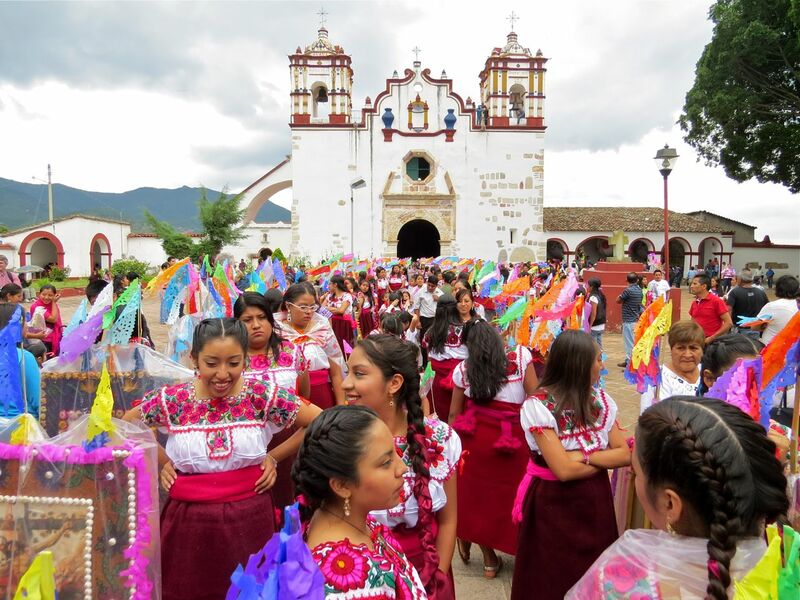 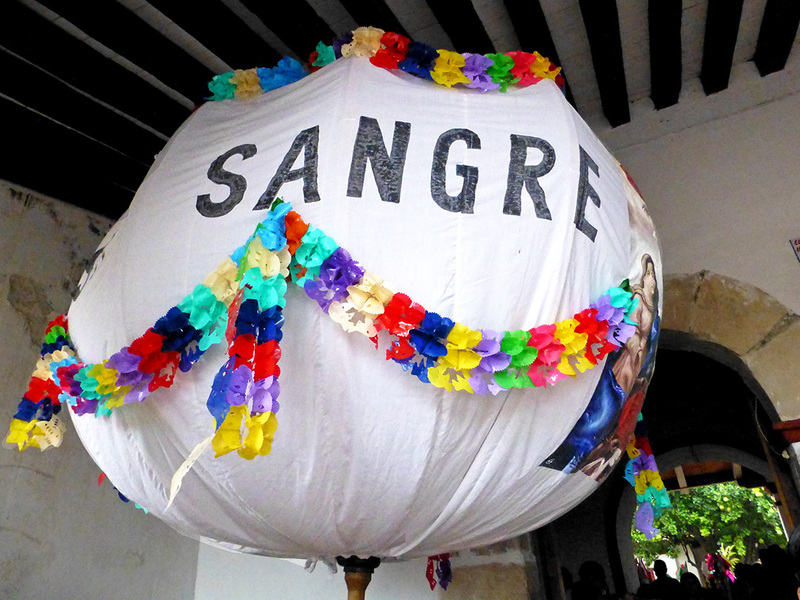 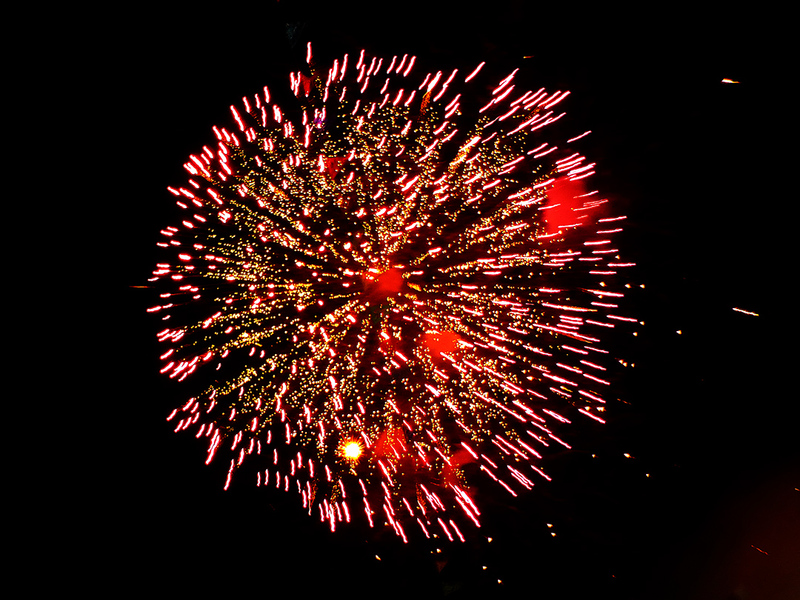 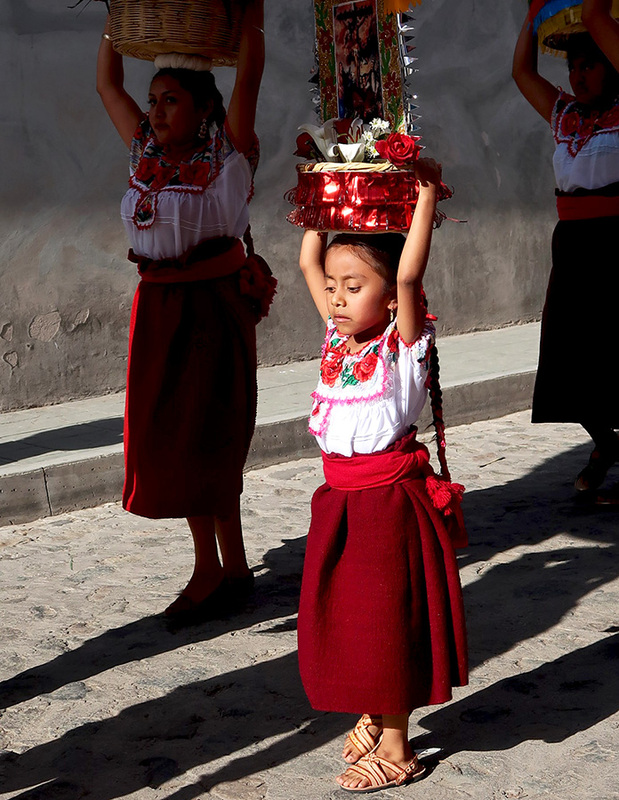 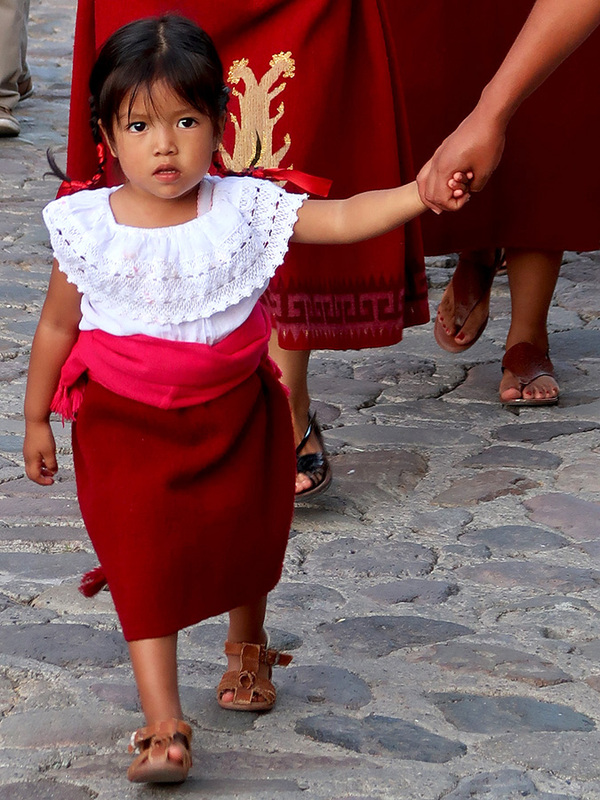 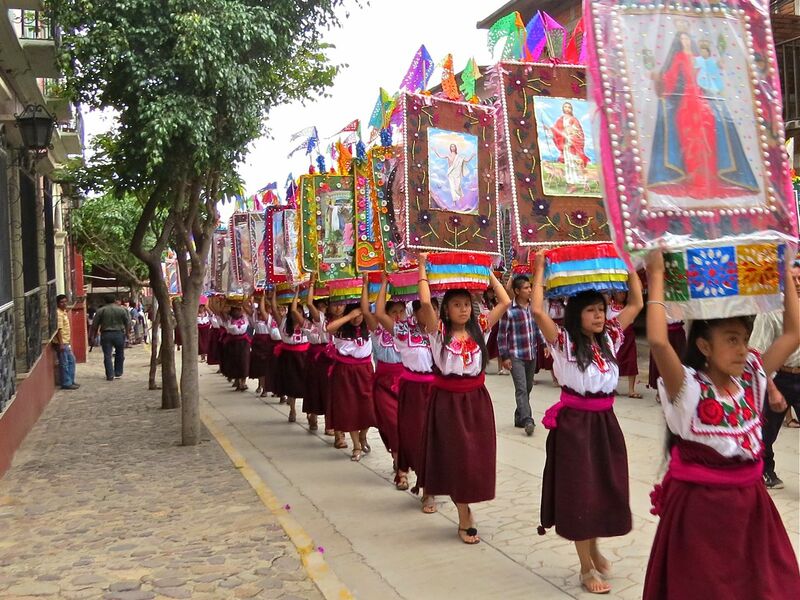 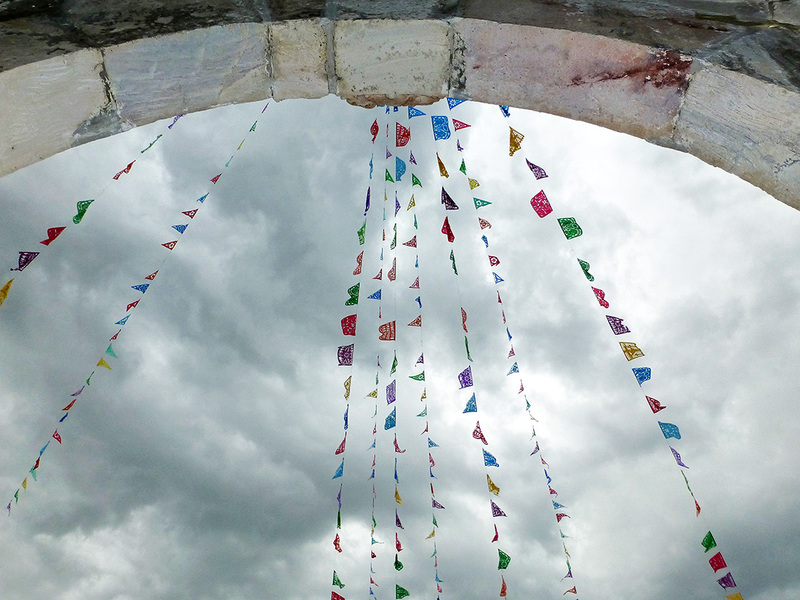 It was photos from the 2007 celebration that first persuaded me to visit Oaxaca. 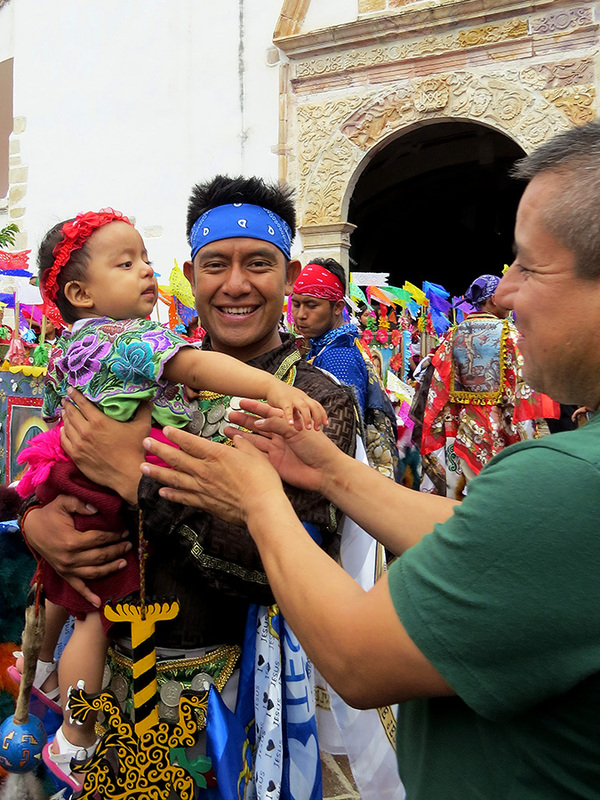 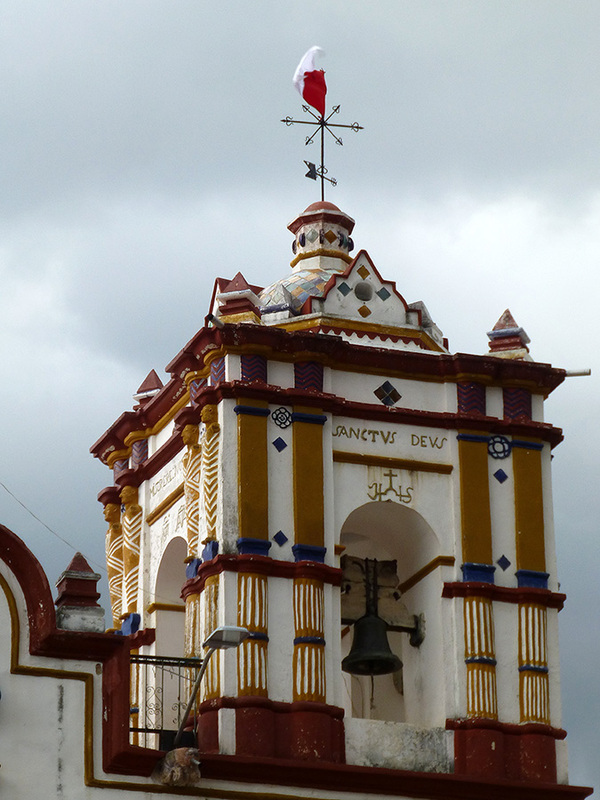 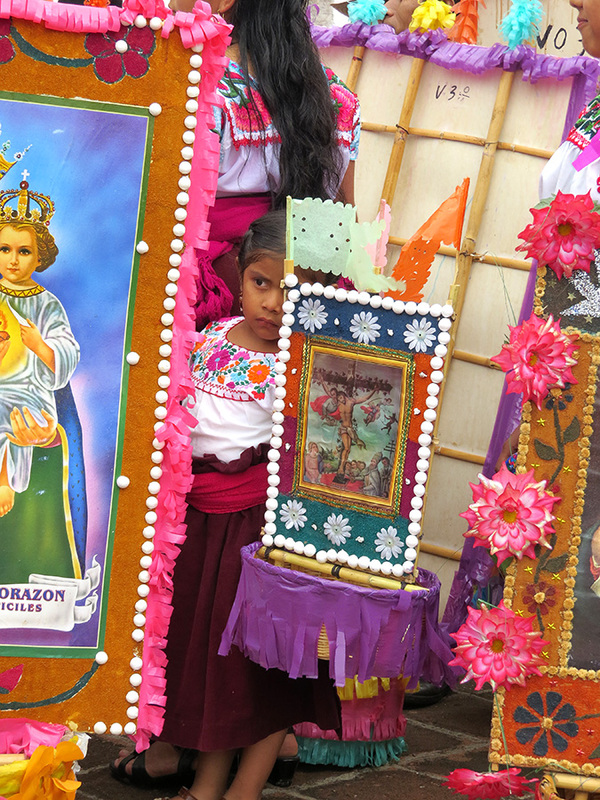 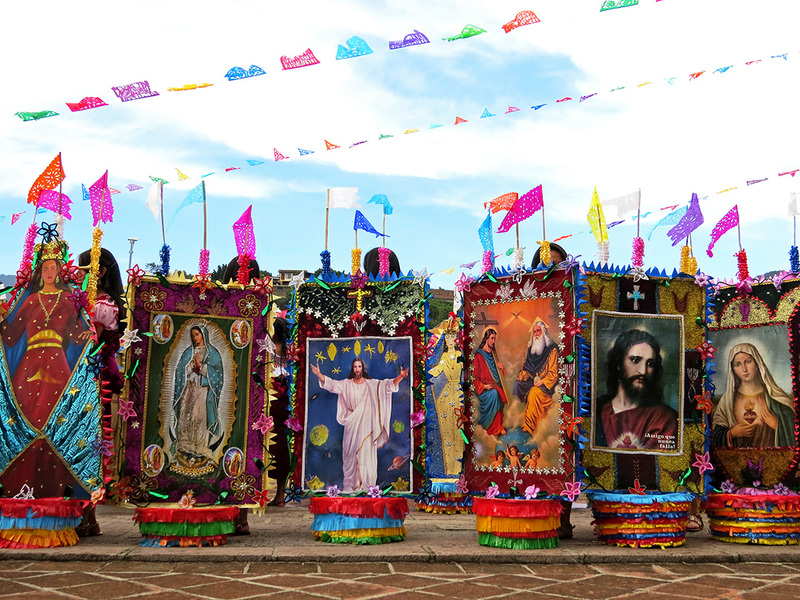 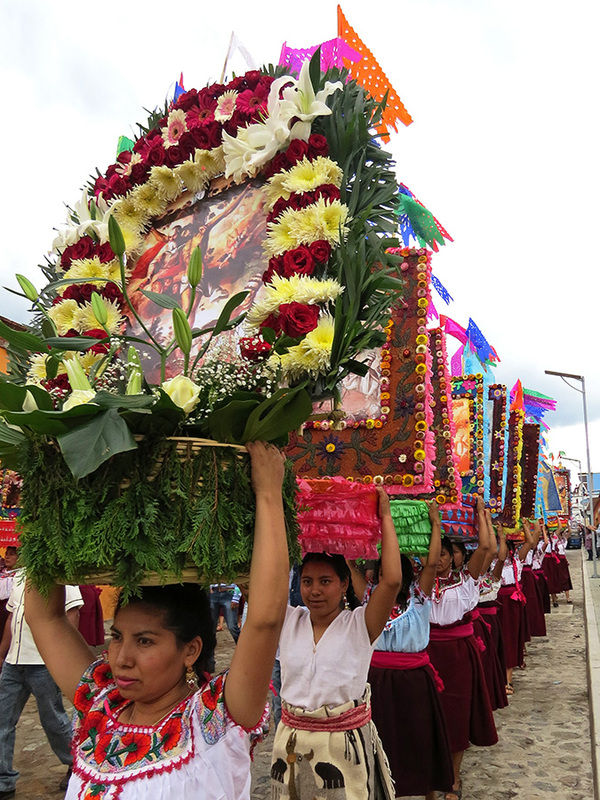 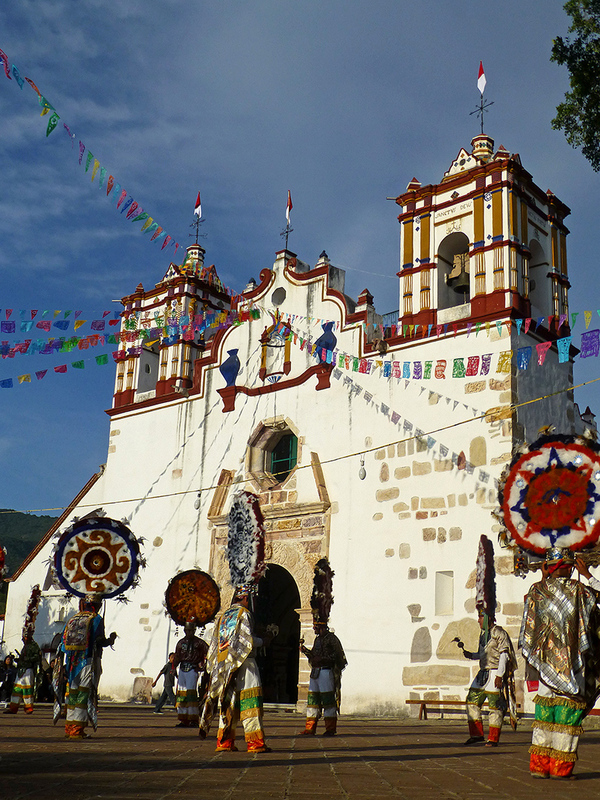 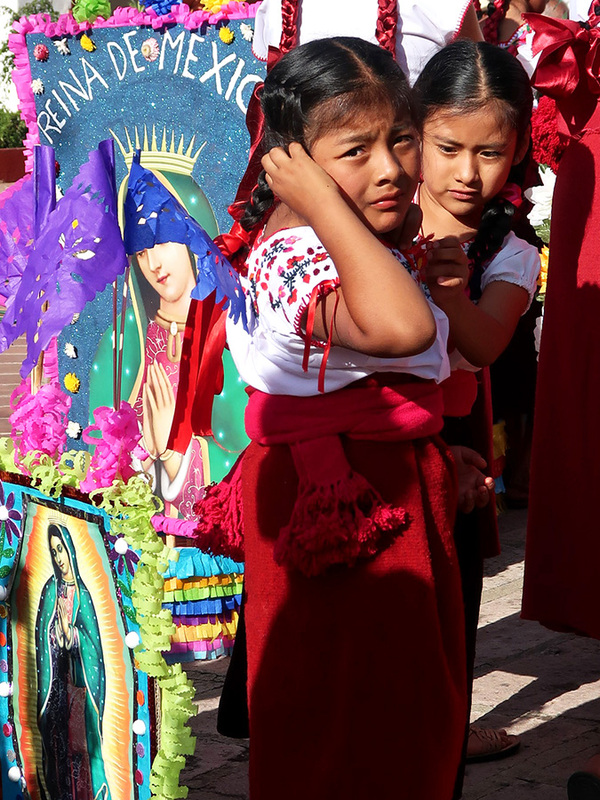 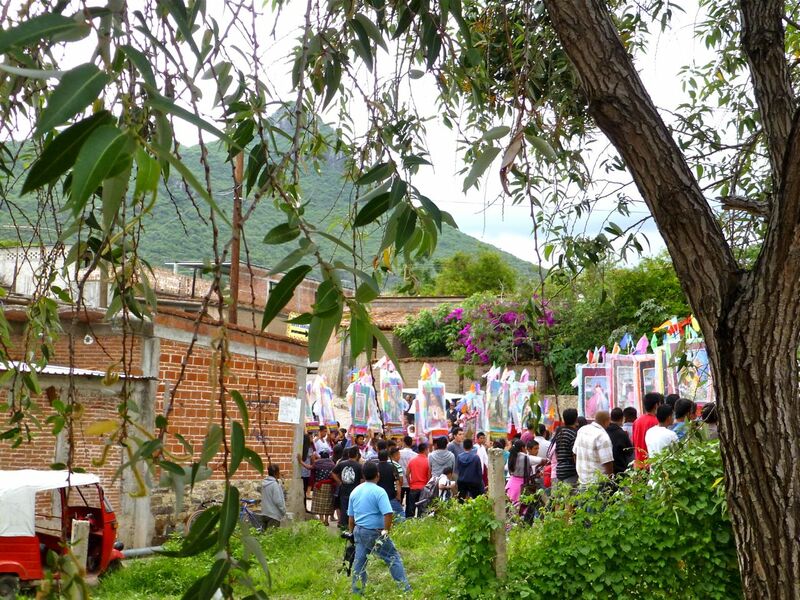 However, this is it… I promise… no more photos from the Preciosa Sangre de Nuestro Señor Jesucristo in Teotitlán del Valle until next year! 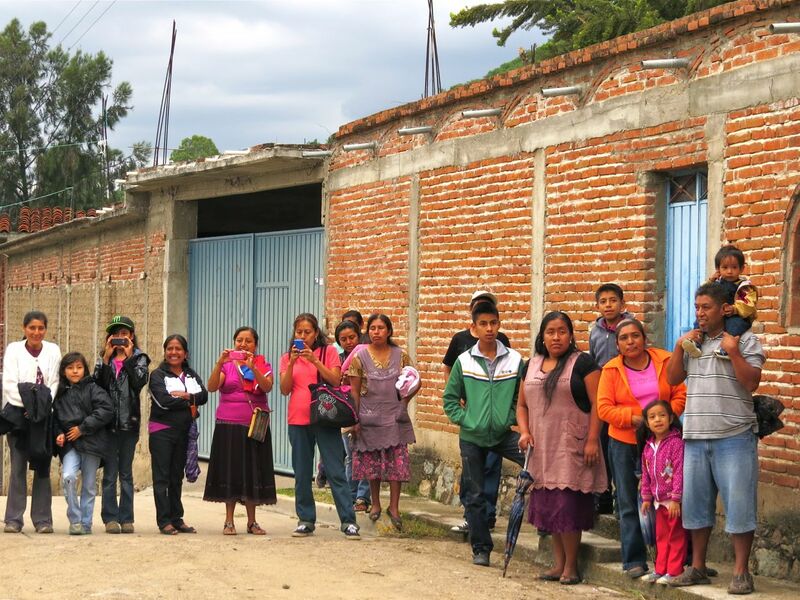 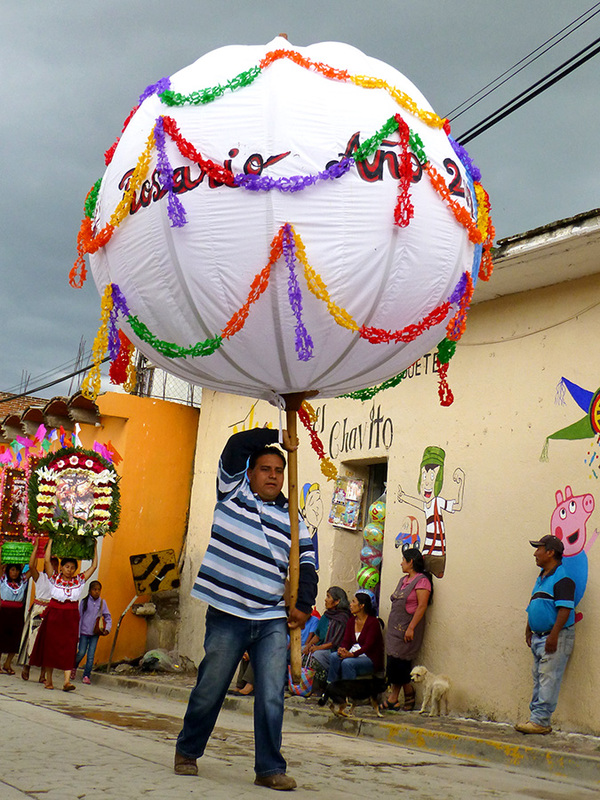 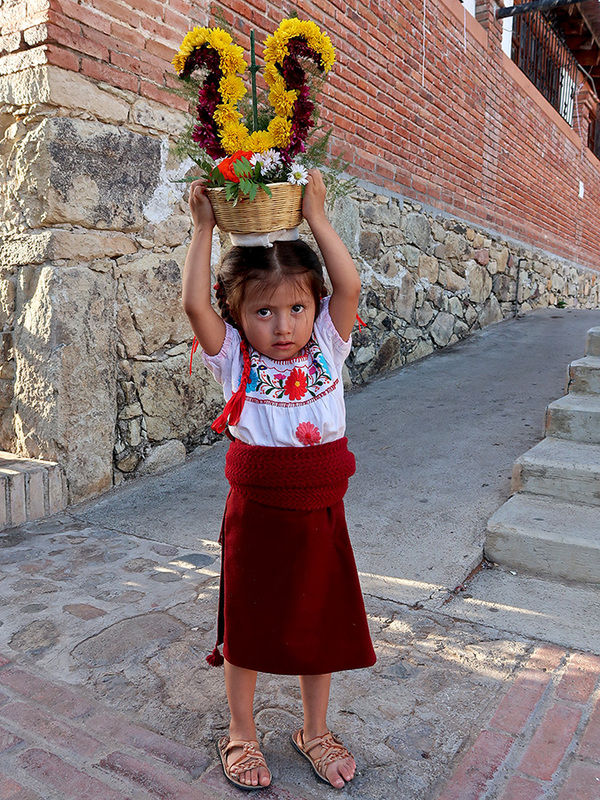 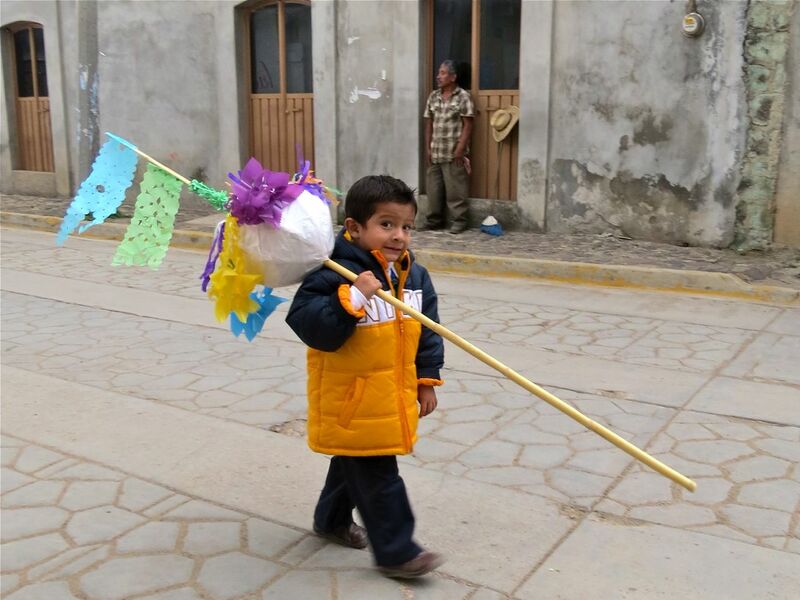 However, if you, like me, can’t get enough… check out Chris’s photos over at Oaxaca-The Year After. 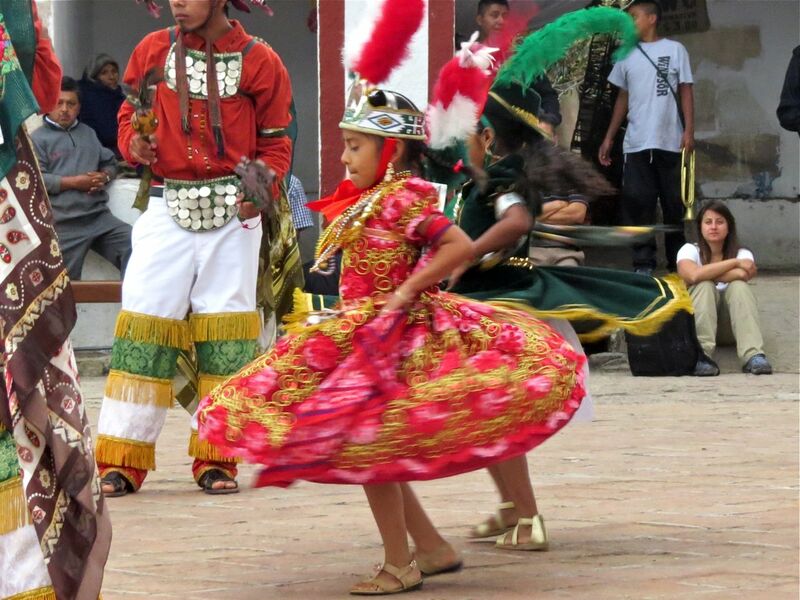 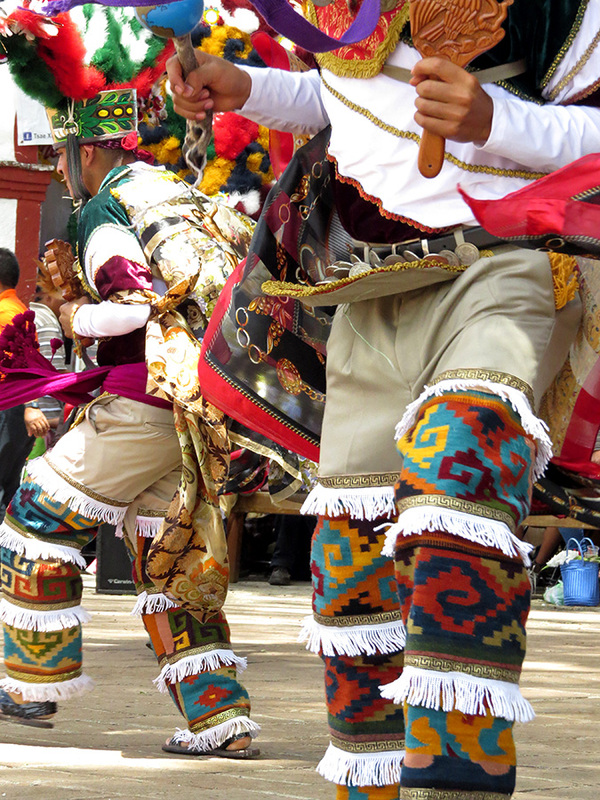 A brief slice from the hours and hours of dancing done by the Danzantes de Promesa, in the plaza in front of the church in Teotitlán del Valle, during the multi-day fiesta honoring Preciosa Sangre de Nuestro Señor Jesucristo. 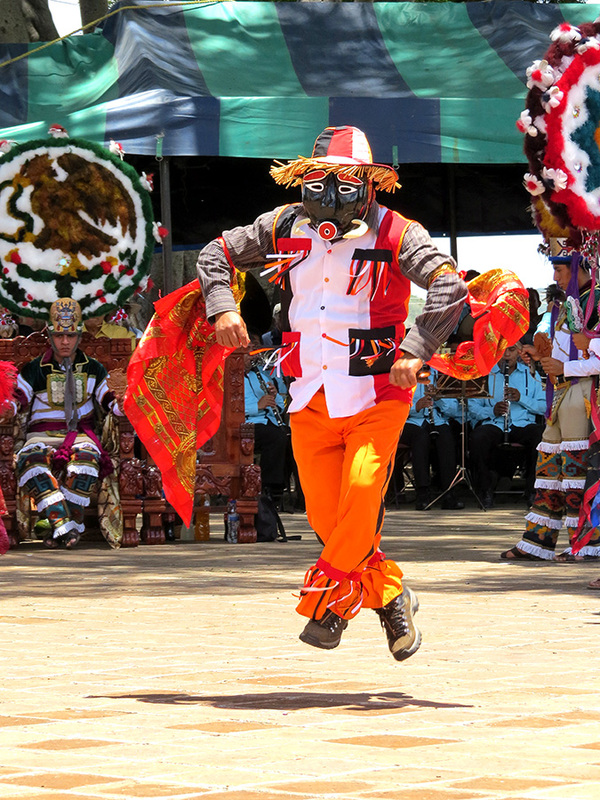 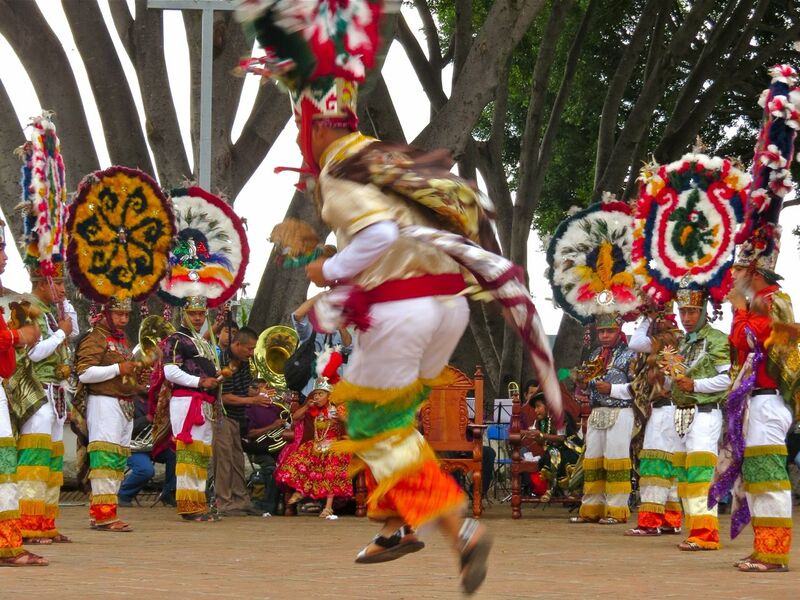 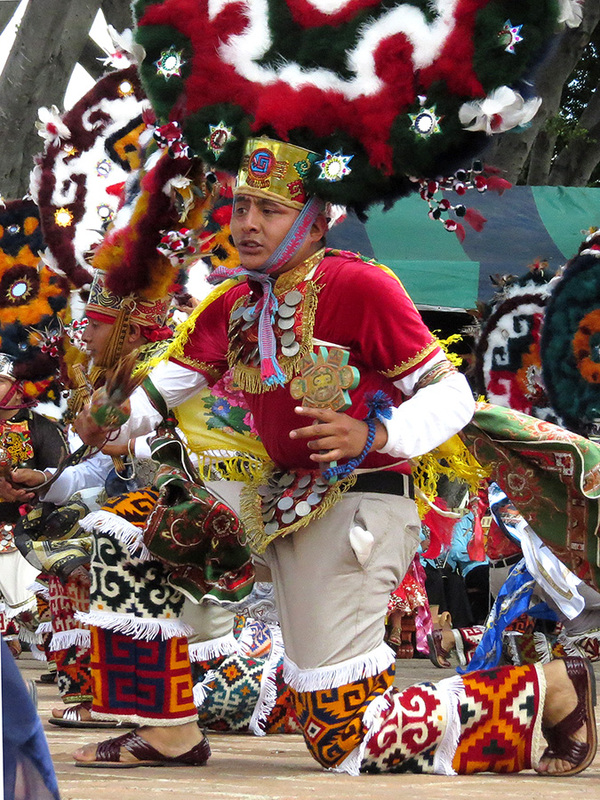 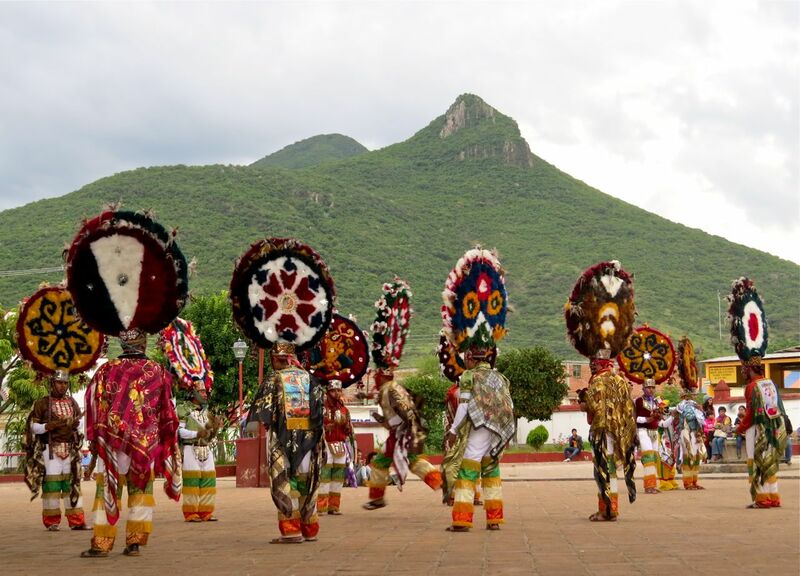 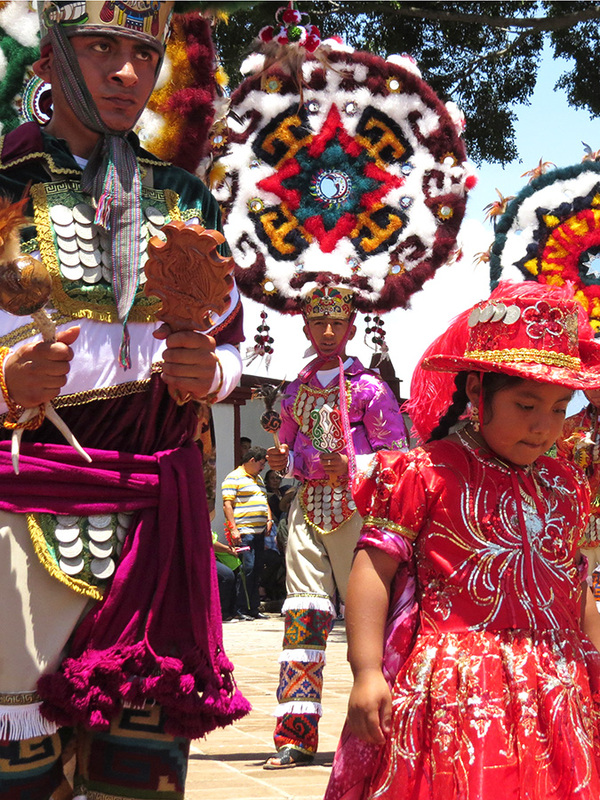 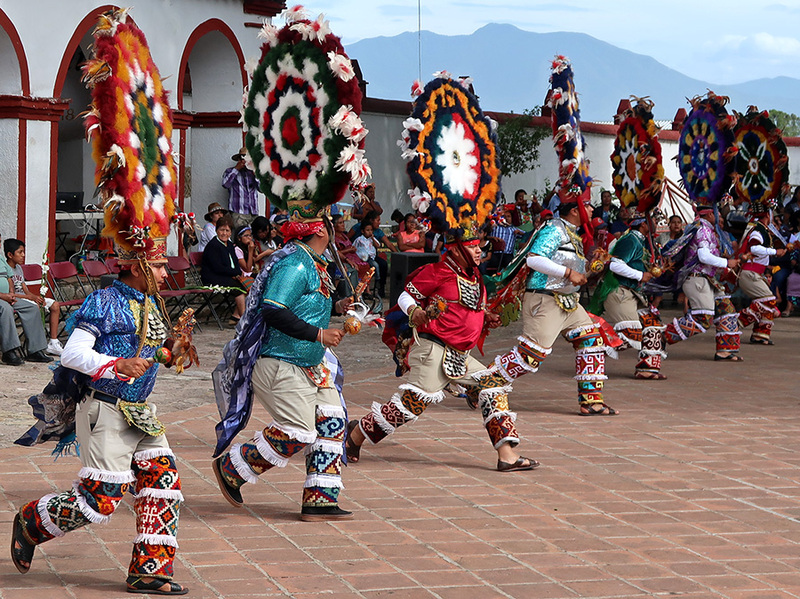 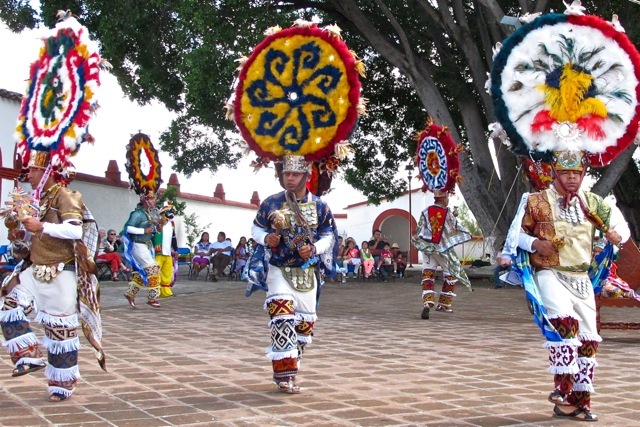 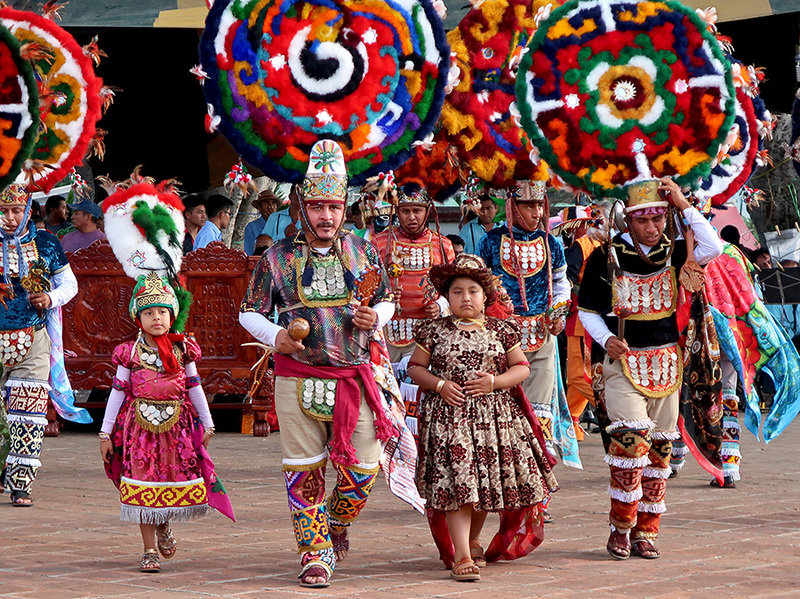 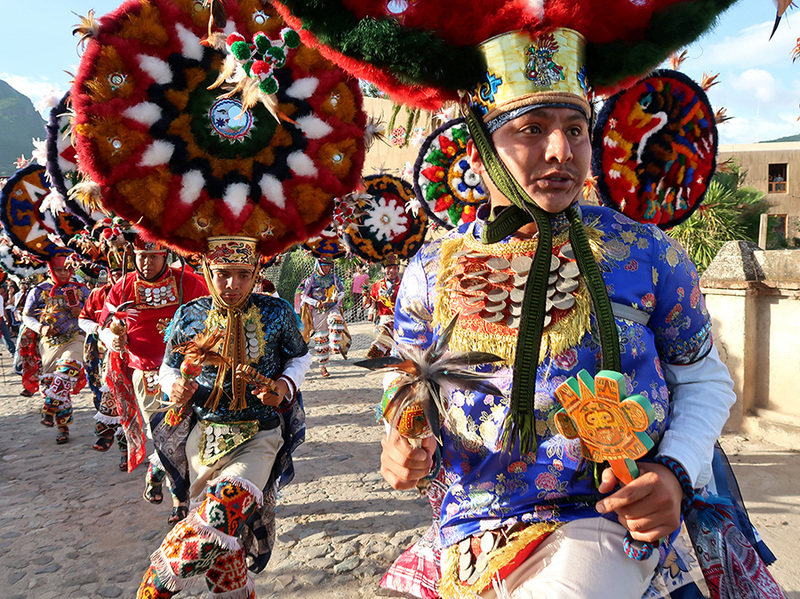 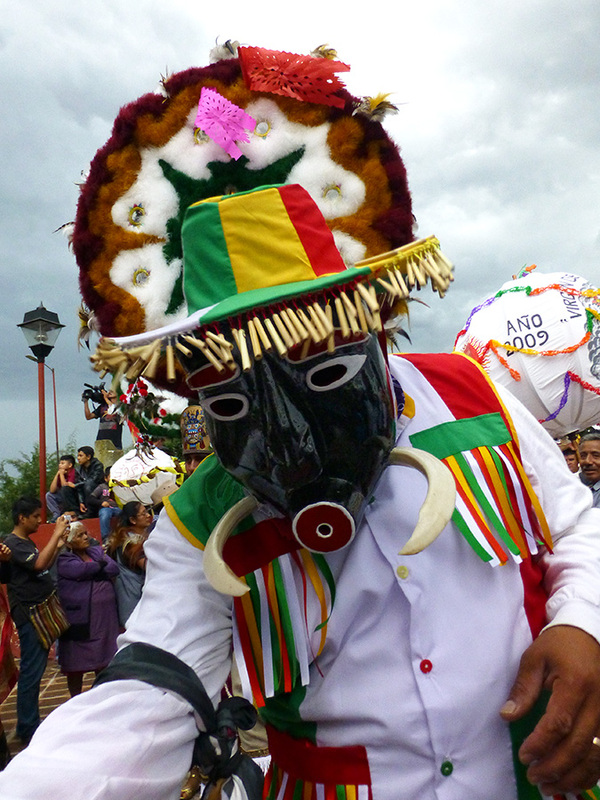 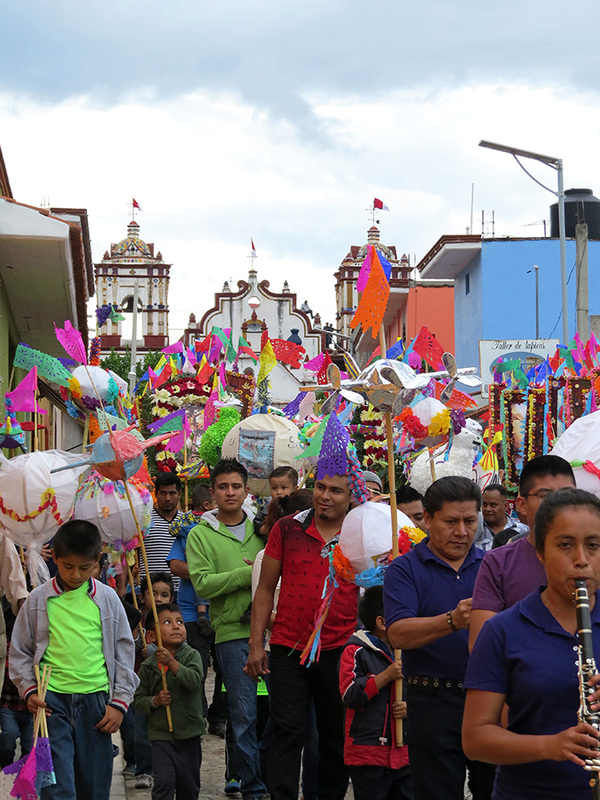 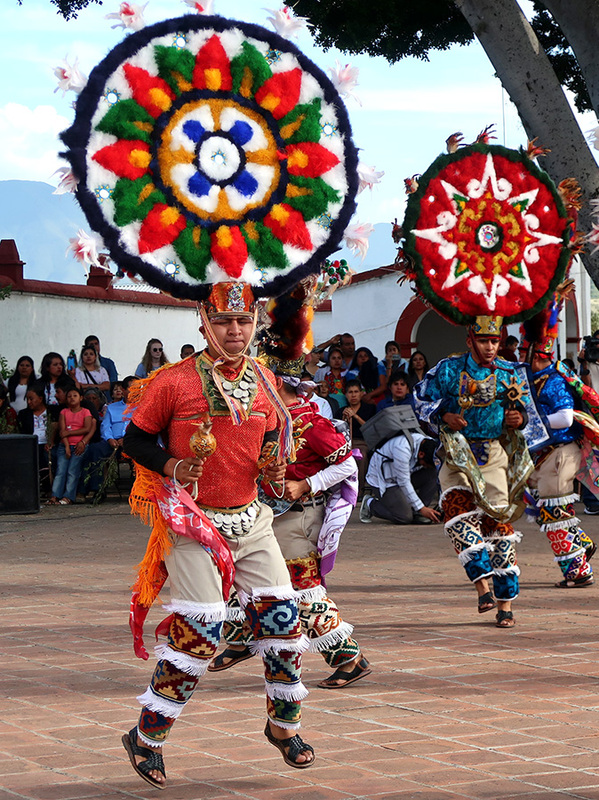 The Danza de la Pluma consists of 41 “bailles” (pieces of music) that, on the surface, reenact the conquest. 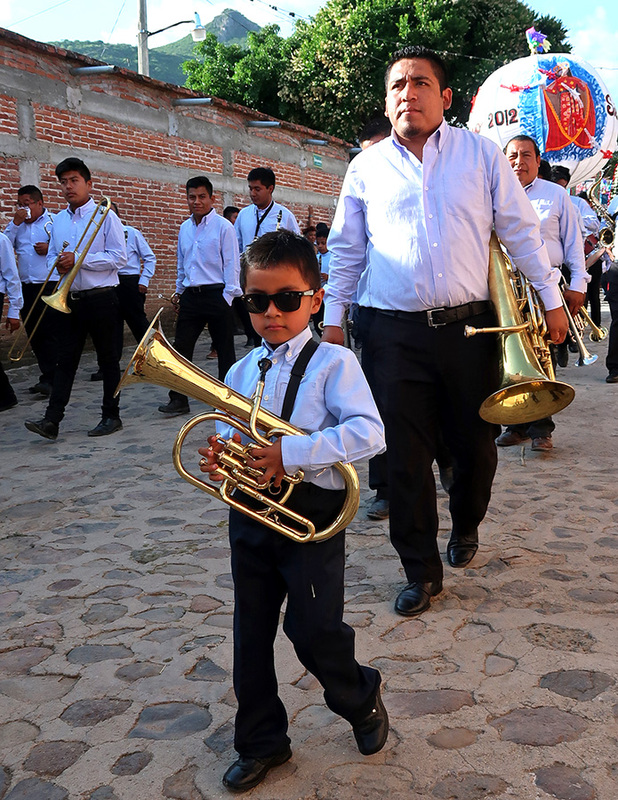 Cortes and his troops are played by very young through teenage boys. 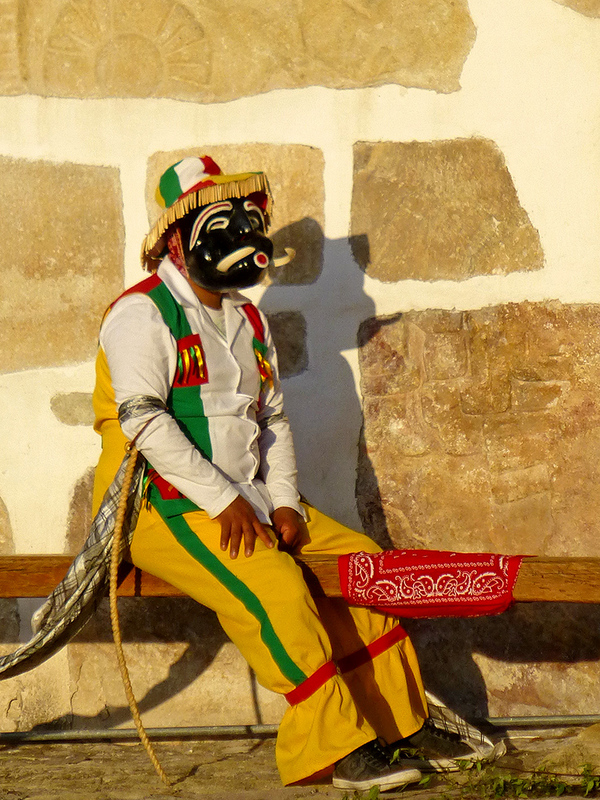 They occasionally march around, but mostly stay seated. 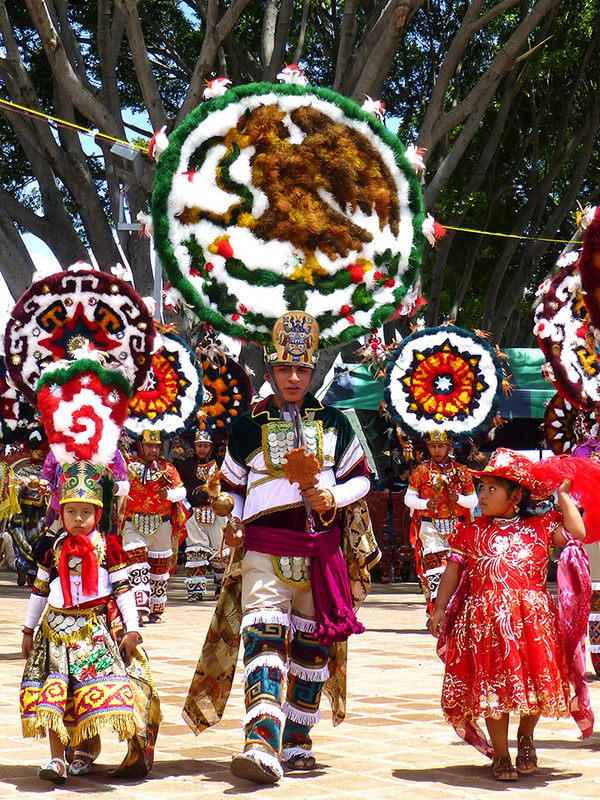 The Danzantes representing the Aztec, on the other hand, are young (and not so young!) 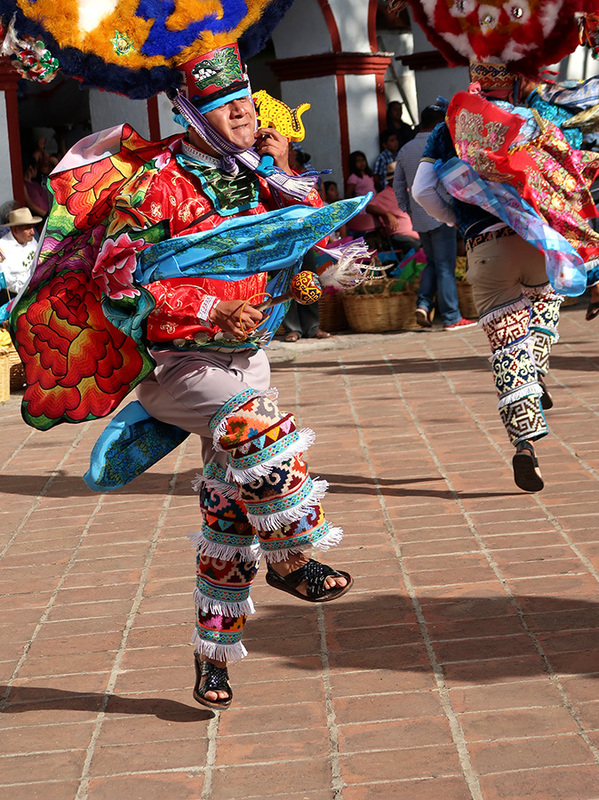 men and dance at least 70% of the time. 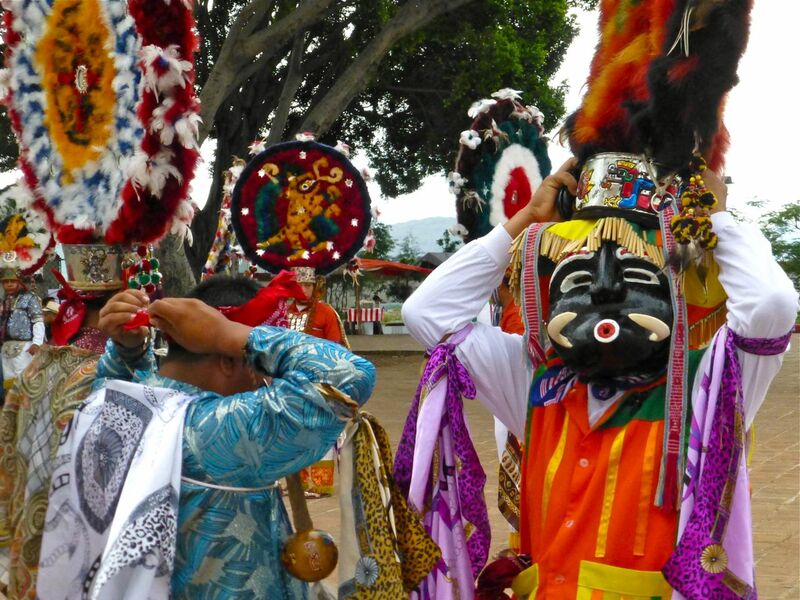 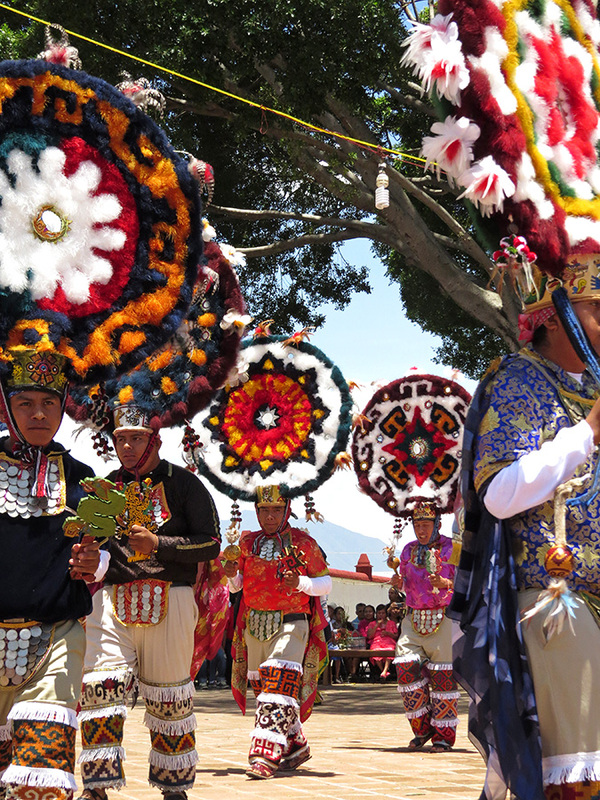 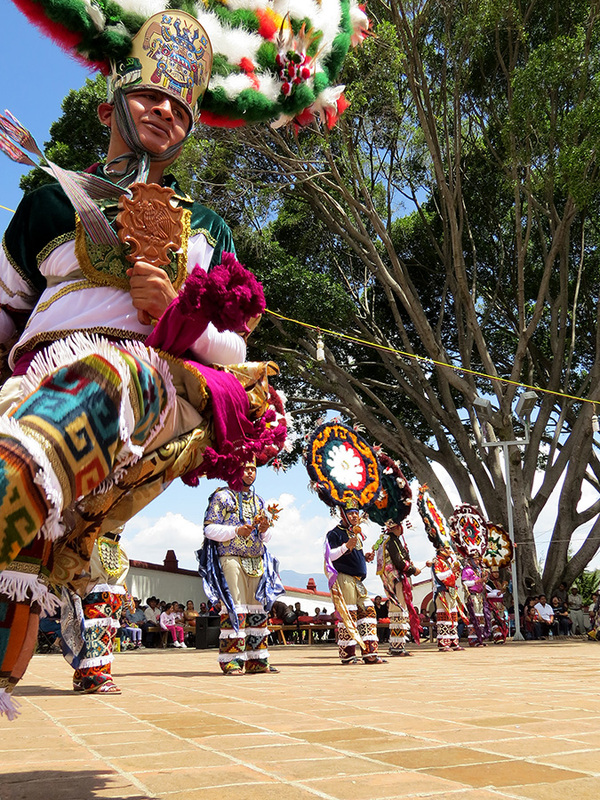 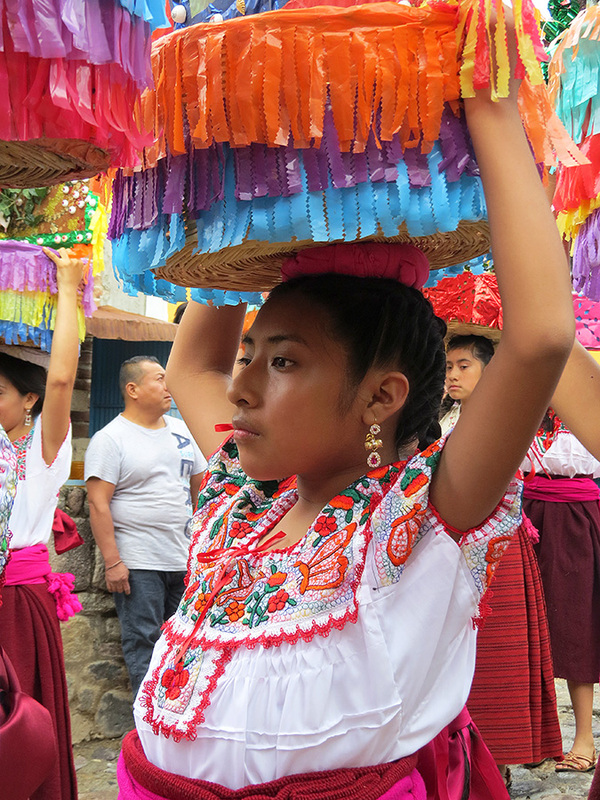 In addition, Moctezuma has some solos and La Malinche and Doña Marina perform several lively dances. 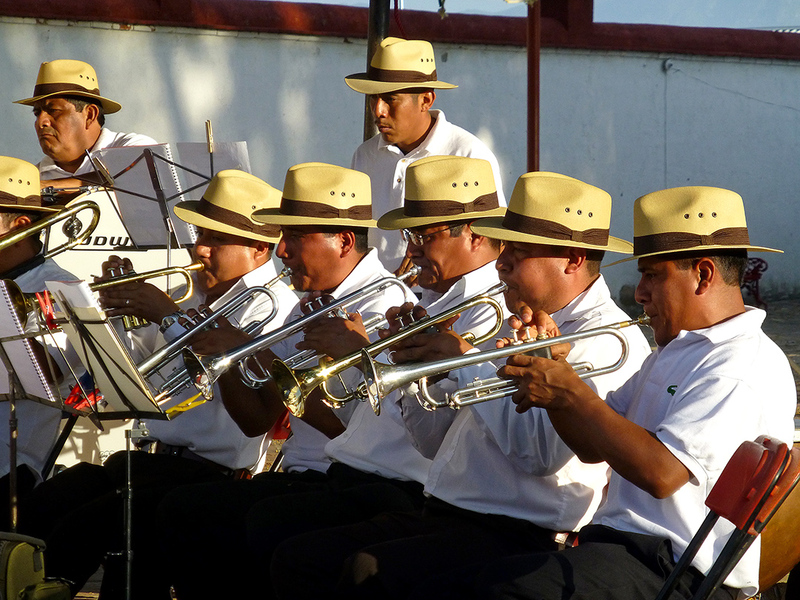 A 20+ piece orchestra accompanies the dancers, playing the proscribed music, including, incongruous to me, waltzes, polkas, and schottisches. 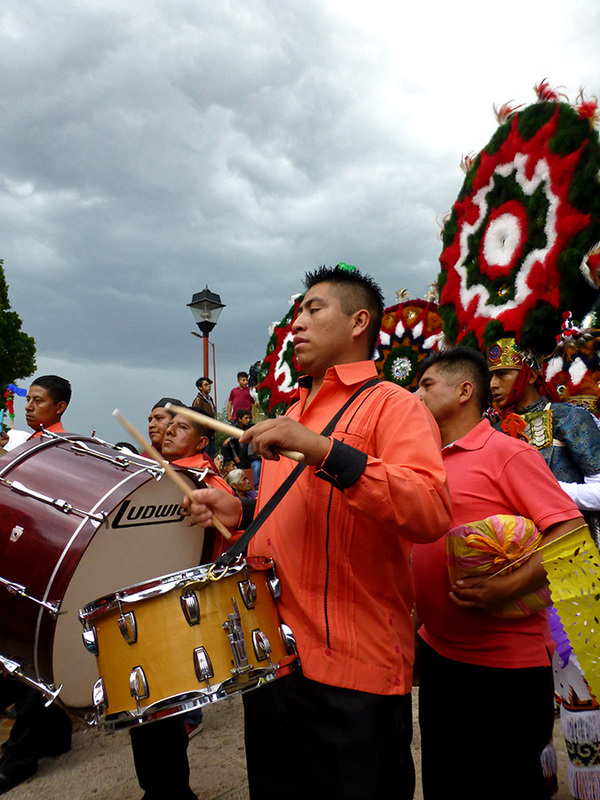 According to the Harris article referenced below, at the end of the 19th century the orchestra replaced the original indigenous drum and flute. 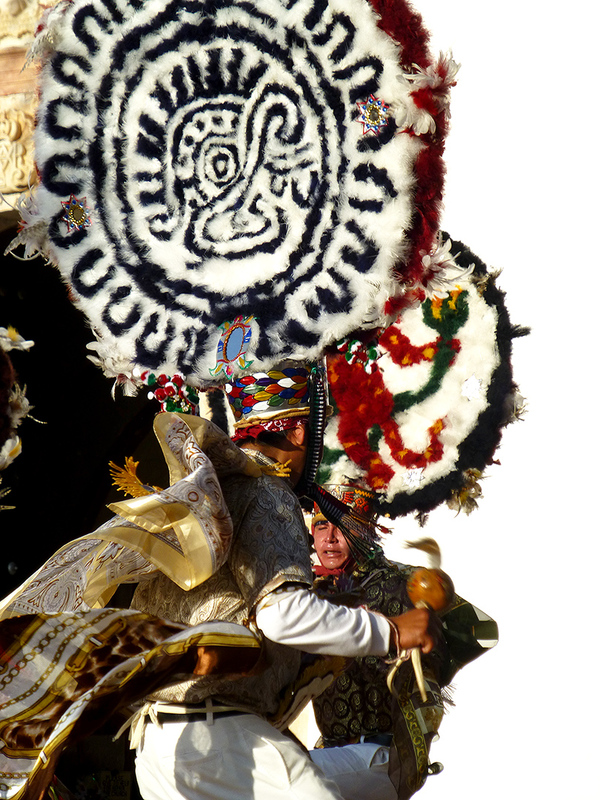 The subtext and “hidden” narratives of the danza are multiple and complex and I’m only in the infant stages of understanding. 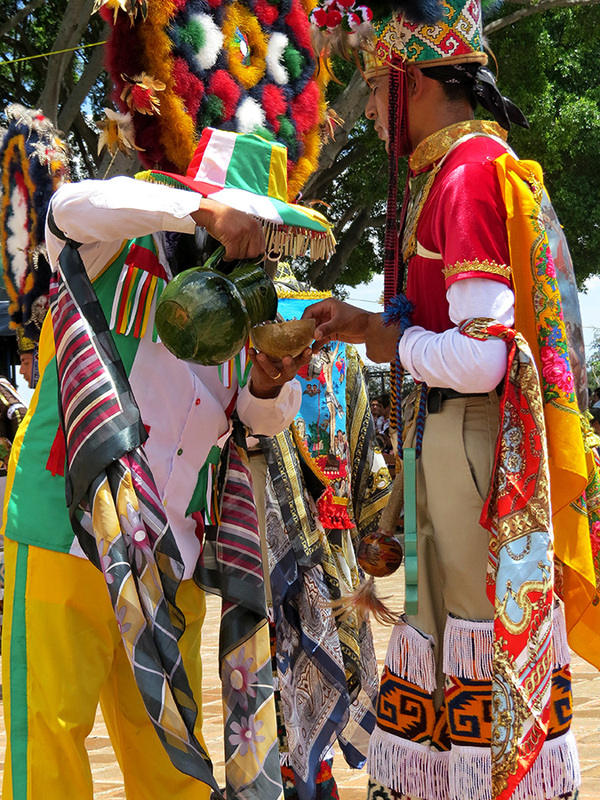 For now, until my Spanish language skills improve significantly and I can talk with someone who is a member of the community, I will leave it to the two scholarly articles listed at the end of this post to attempt interpretation. 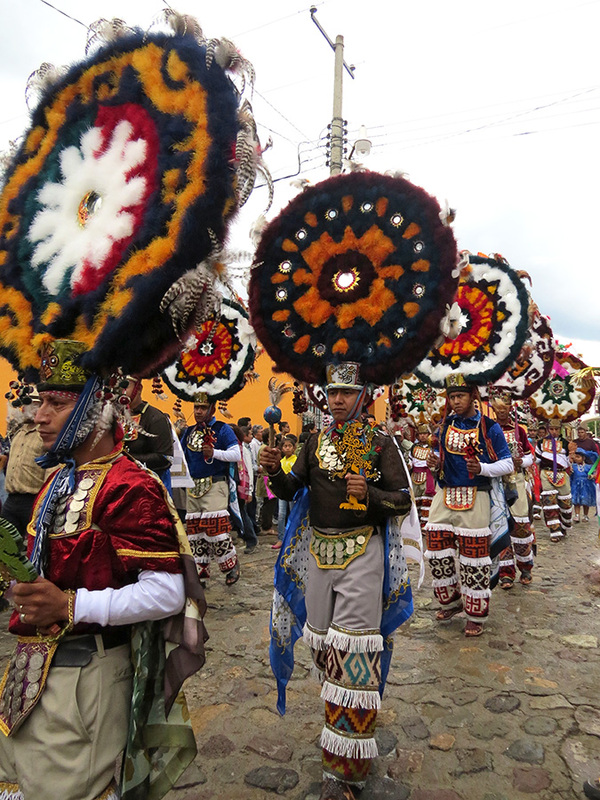 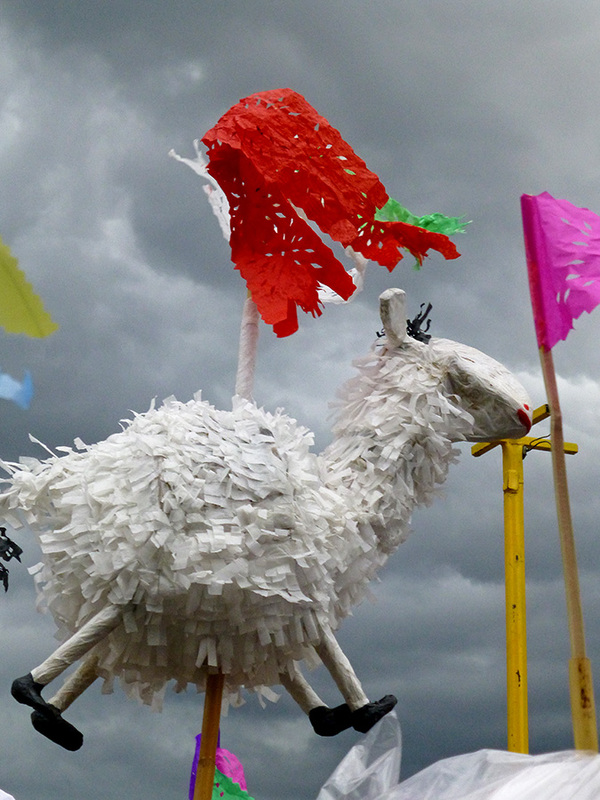 By the way, the day was overcast and windy at times, with gusts threatening those enormous and extremely top-heavy headdresses. 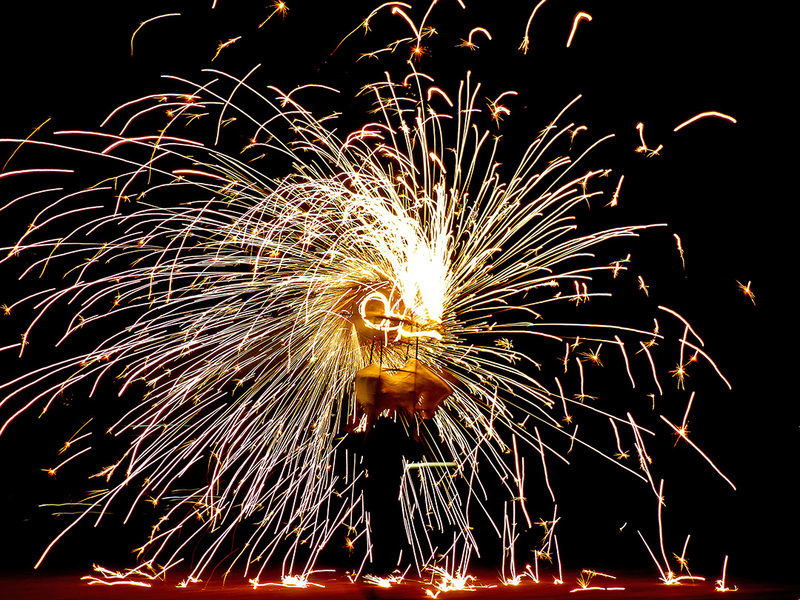 Now that I’ve done some research (alas, after the fact)… I want to see it again!